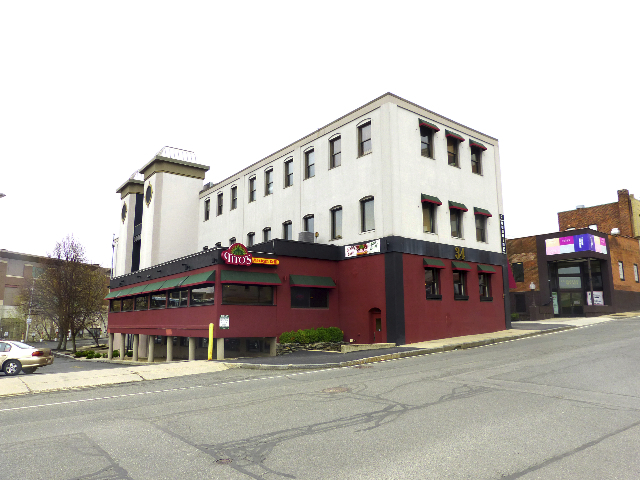 The Pittsfield landmark has undergone many incarnations. 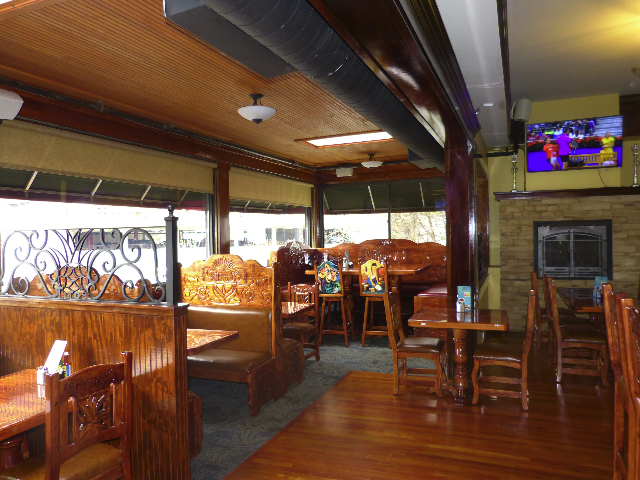 The Tex Mex themed interior. There is more attractuv e lighting near the bar. Furniture carved with the restauran't logo. 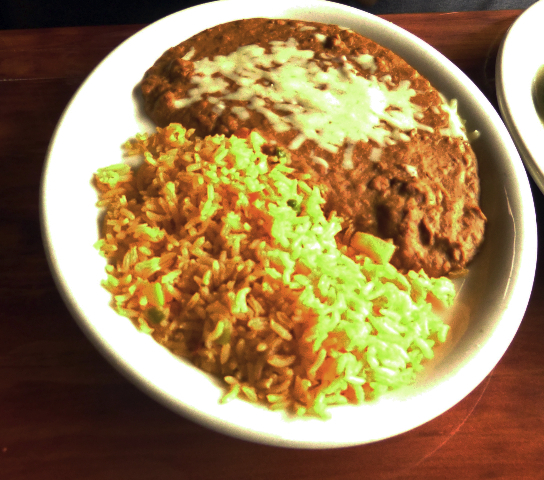 The chicken came with a plate of rice and refried beans. 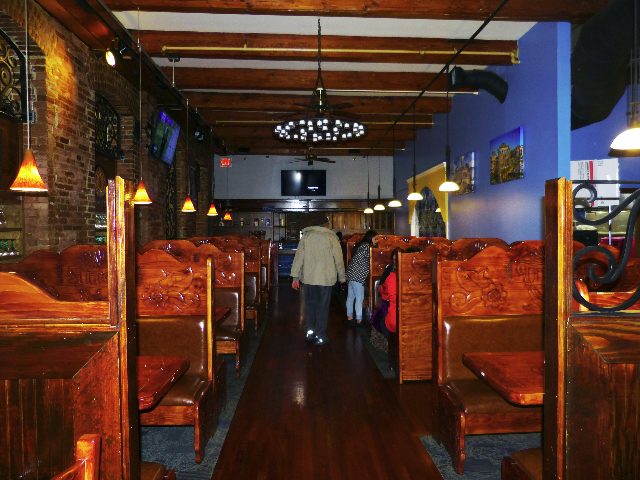 The large, freestanding building that houses the recently opened Tito’s Mexican Grill is set back from North Street in downtown Pittsfield, Mass. It is located steps from the town parking lot which has recently installed meter booths. After six it is free. When we returned we noted tickets on windshields. The restaurant offers limited free parking. The venue, which has gone through a number of incarnations from micro brewery to Baba Louie’s over priced pizza, seemed to be cursed. Yet again, the space had undergone an extreme makeover. The décor reveals big bucks for high concept and slick interior design. 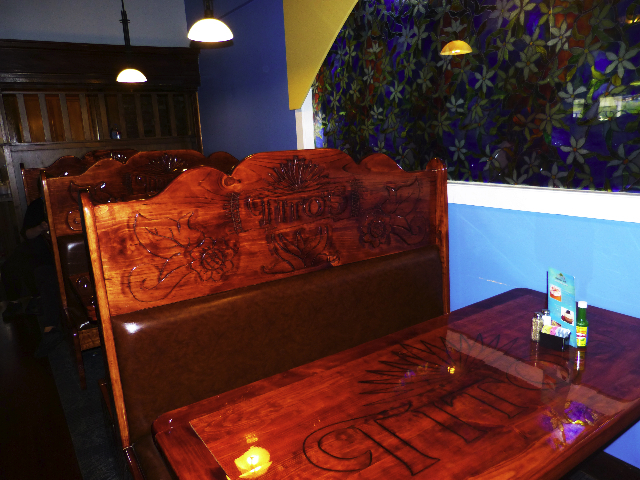 The booths have a hand carved feeling with the Tito logo as part of the furniture as well as embedded in the laminated table tops. Previously the restaurants had a sense of disorienting sprawl. Now it is more compact as the back function room has been eliminated. A Pittsfield location is the third for an Ohio based company. There is definitely a franchise feeling to the space and its vast but blandly generic menu. It’s a bad omen that a Tex Mex restaurant is headquartered in Ohio. That’s a long and improbable distance from deep in the heart of Texas. Not to mention the other side of the Rio Grande. Coming up with that sprawling menu the culinary staff seemed to be more focused on bean counting than bean cooking. One detects an eye on the bottom line about factors like portion control, mass produced sauces, frozen ingredients and modular elements. While Tito’s currently has three venues it hints to greater expansion. This may be an early phase of the next Taco Bell with a somewhat more personalized ambiance. At least for now. The really telling point is that one is likely to get a better and more consistent meal at Taco Bell. Just saying. There are already better Latin themed restaurants in Pittsfield. 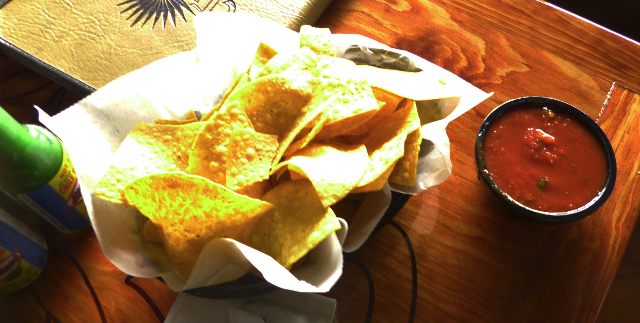 There is the best in the Berkshires Colombian restaurant La Fogata off the beaten track. On the main drag of North Street there is the so so Panchos and a fabulous burrito joint Hot Harry’s. In Williamstown check out the superb Coyote Flaco which is just out of town and a great destination. With a hankering for Tex Mex the Pit Bulls met for lunch. We like it hot. Pancho had visited previously and complained about the lousy fajitas. But Cisco wanted to check out the latest incarnation of a landmark downtown building. First impressions were encouraging and Pancho was up for giving it another try. There were a lot of lunch combos for an affordable $8.95. But for a little more we opted to upgrade to the dinner entrees at $12.95. For Cisco the true test for a Mexican restaurant is its enchiladas. After considering options he settled on the San Jose Special. 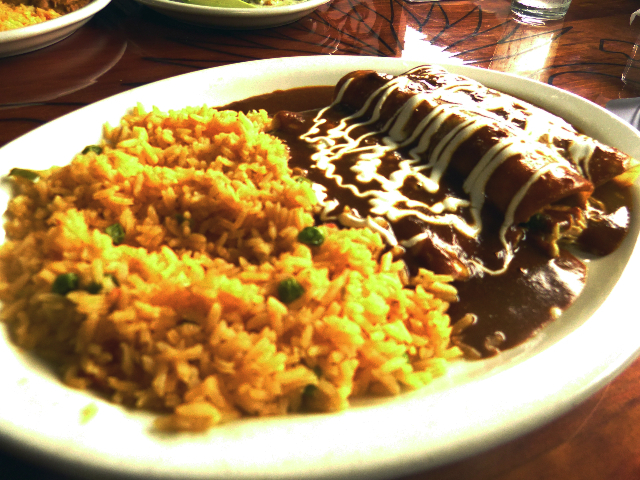 It offered three different versions with chicken, beef and cheese with salsa sauce, sour cream and Spanish rice. The right out of a can salsa topping appeared to be the same bland and ketchup oriented dip for the complementary basket of chips. This was augmented with generous splashes of hot sauce for a bit of flavor and spice. The enchiladas were rubbery and suggested being prepared long before serving and zapped. It wasn’t much better than what one can buy in the frozen food section of a supermarket. 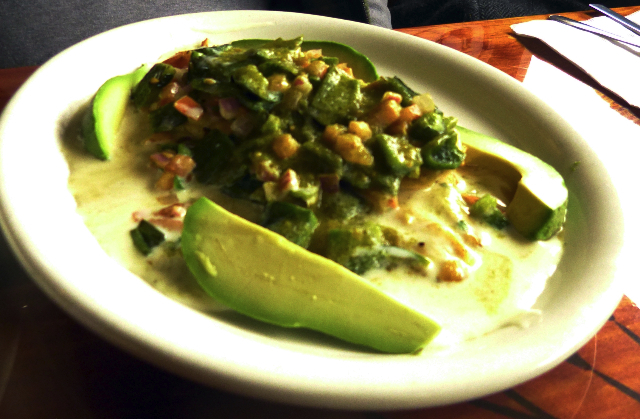 The tough, tasteless chicken languishing beneath a mish-mash verde sauce also seemed anything but fresh. It was accompanied by slices of avocado. There was a side plate with a generous portion of rice and refried beans. That helps to convey the notion that one is getting a lot of food. A lot of cheap rice, however, doesn’t offset skimping on fresh chicken. The service, even though the restaurant was all but empty, was abysmal. The manager brought our food and disappeared. The waitress was spending much of her time explaining to clients in the next booth why she couldn’t make guacamole at their table. At $8.99, as he explained to her, it was the primary reason he had returned. It seems the waitress who does it had finished her shift. The one on duty hadn’t been trained in the ritual. She had no time, it seems, because she also works at Coyote Flaco. After that encounter she disappeared as I waited to have my water refilled. No such luck. Retreating from a numbingly mediocre dining experience we wondered how long it will be before the landmark venue undergoes another extreme makeover.